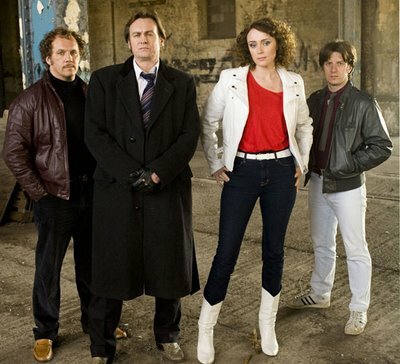 In the last two weeks, I have become completely addicted to Ashes to Ashes. It started out as casual viewing over Saturday night pizzas with J and the kids (movie choices always seem to degenerate into an argument so we went with this) and has ended this weekend with me ‘n’ J watching all eight episodes of season two. Not in one sitting mind – but it was two episodes Friday night, two episodes Saturday lunchtime, three episodes with dinner last night and the season finale over breakfast this morning! Season 3 started filming last November and will hit TV screens in the UK in Spring 2010. I cannot wait. What will Alex do? Who is Gene Hunt? Can Chris’ dress sense get any worse? What is the wipe-clean wonder fabric that Alex’s white jacket (entirely unsuitable for police work I would have thought but hey, this is the 80s) is made from? Will Shaz do more than make tea? And will Raymondo get himself a girl? This entry was posted in On The Box and tagged 1980s, Alex Drake, Ashes to Ashes, Audi Quattro, Duran Duran, Gene Hunt, Rio by Kym Hamer. Bookmark the permalink.